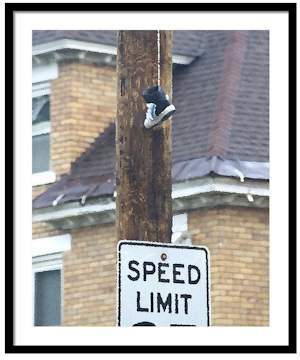 The practice of throwing shoes (or boots) in the air to wrap around a utility line (power, phone, cable, etc) has been described as everything from “angels feet” marking the death of a gang member to ‘just another prank by drunken students’. There are web-sites dedicated to discussing it, celebrating it, recording it. 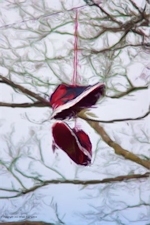 One person decided that since the shoes tend to hand around for a while, it is a form of graffiti and coined the term ‘ShoeFiti’. I offer no opinion as to the origin or symbolism, but living in an urban area, I frequently see them. And being a photographer, I take pictures and I’ve started putting my favourites on apparel and gift items. 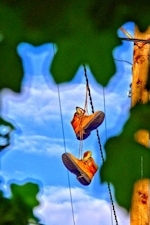 A small number of our images are available as Fine Art Posters. We are adding selected works and rebuilding our Galleries at Fine Art America – offering prints on canvas, acrylic, wood, metal and (of course) fine papers. Eight fine papers and multiple mat and frame options allow you to customize the presentation of your genuine Digital Gryphon Fine Art print.